I’m interviewing Tempe O’Riley today on my LJ as part of her release day tour for Whiskers of a Chance with Creative Minds Promotions. There’s also a rafflecopter giveaway. I’m hosting Denise Dearth and Amy Gillen today on my LJ as part of their release day tour with Eyes on Books for their new release Blind Redemption. There’s also a rafflecopter giveaway. I’m interviewing Cheryl Headford today on my LJ as part of her blog tour with Creative Minds Promotions for her new release with Harmony Ink Press, Hostage. There’s also a rafflecopter giveaway. I’m hosting Ioana Visan today on my LJ as part of her release day blitz with Eyes on Books for Broken Hearts. 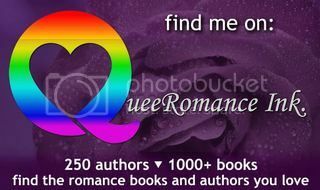 I’m taking part in the Pride Blog Hop which runs from 21-28th September. A big thanks to Divine Magazine for hosting and organising the rafflecopter giveaway. You can read my post on my LJ. I’m hosting Three is Not a Crowd anthology authors today as part of their blog tour with Eyes on Books. There’s also a rafflecopter giveaway. I’m blogging at Kim Fielding‘s about Winter Duet as part of her ‘Blast from the Past’ series. I’m interviewing fellow Kiwi author, Sharlene Almond, today on my LJ about her book Initiated to Kill. A lovely 4.75 review for On Wings of Song from Kris at Joyfully Jay. Thank you! You can read the review here. I’m hosting Denise Dearth and Amy Gillen today on my LJ as part of their cover reveal with Eyes on Books for Blind Redemption. There’s also a rafflecopter giveaway.